When your job is marketing the state to new businesses, there are some calls you’re happy to take – even on your day off. Christopher Chung, chief executive officer of the Economic Development Partnership of North Carolina (EDPNC), was enjoying a well-deserved Friday off in February 2017 after attending a conference in San Diego when he got the call from North Carolina state Senator Jay Chaudhuri. “He said, ‘I know this gentleman from a company exploring expansion opportunities throughout the United States, and North Carolina is on their radar. I’d love to help make an introduction,’ ’’ Chung recalled. Wake County Economic Development hosted a September 2017 panel discussion on how the Infosys project was won. Panelists included, from left: Tom White, Director, Economic Development Partnership, N.C. State University; state Sen. Jay Chaudhuri; Anurag Varma, Infosys Vice President of Global Government Affairs; Tom Looney, Chairman of the Wake Technical Community College Board of Trustees (and EDPNC board member); and Christopher Chung, Chief Executive Officer, Economic Development Partnership of North Carolina. Five months later, Infosys, a leading global technology consulting company headquartered in Bangalore, India, announced it had chosen North Carolina’s Research Triangle region for an $8.73 million innovation and technology hub. In terms of employment, the Raleigh hub – expected to grow to 2,000 employees by 2021 – is one of the largest economic development wins in Wake County’s history. 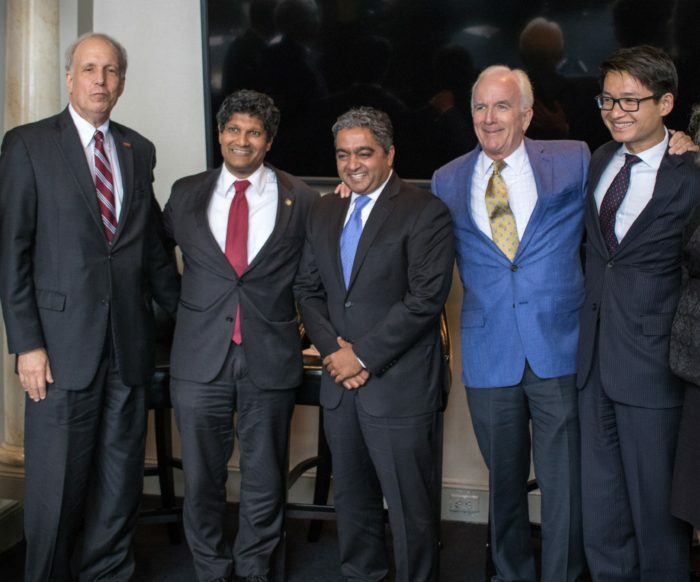 Chaudhuri introduced Chung to Anurag Varma, Infosys vice president of global government affairs, who was overseeing the company’s search to establish four U.S. innovation and technology hubs that will ultimately employ 10,000 American workers. The introduction was part of an effective team effort that landed one of the hubs in North Carolina, as Virginia, Texas, Georgia and other states joined the competition. “The EDPNC, the Greater Raleigh Chamber of Commerce and our other partners spent a lot of time to understand exactly what Infosys wanted to accomplish and how to make the best possible case – not just for the state, but for the region and community,” Chung said. The four hubs will advise Infosys’ U.S. corporate clients on how to leverage emerging technologies in areas such as digital transformation, cloud infrastructure, artificial intelligence, cybersecurity and big data analytics. Infosys’ search priorities included locations that had a thriving IT sector, a strong academic ecosystem, and existing Infosys client clusters. As the company’s interest in North Carolina narrowed to the Triangle, the EDPNC and its local partners at the Raleigh Chamber of Commerce and Wake County Economic Development (WCED) arranged roundtable discussions that focused on the experience of corporations already located in Wake County and the area’s educational ecosystem. In September 2017, Infosys announced Raleigh would be the home of its North Carolina Technology and Innovation Hub. Pictured from left to right are Infosys Chief Financial Officer M.D. 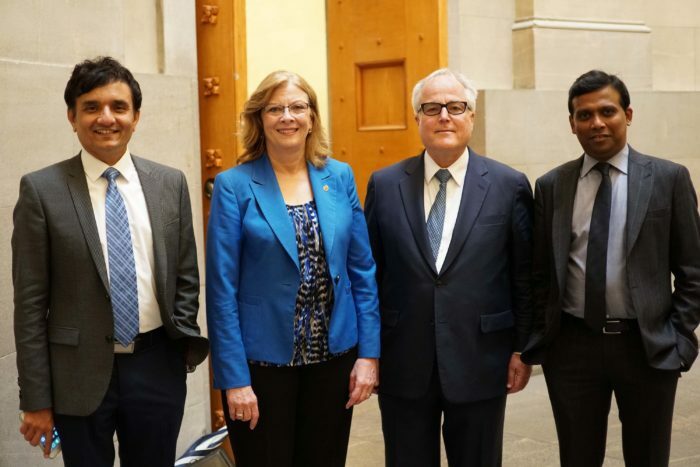 Ranganath, Raleigh Mayor Nancy McFarlane, North Carolina Commerce Secretary Anthony M. Copeland, and Infosys President Ravi Kumar. Wyckoff said Infosys “was very impressed with the company partners” that the Raleigh Chamber and the WCED lined up to speak with Varma and Infosys President and Deputy Chief Operating Officer Ravi Kumar. The business roundtable discussions included local executives from contract research company QuintilesIMS (recently rebranded as IQVIA), Wells Fargo, software company Citrix and Kane Realty Corporation. To showcase the role the Triangle’s universities and colleges can play, the EDPNC arranged a meeting with officials from the North Carolina Community College System, Wake Technical Community College, North Carolina State University and William Peace University. “We found the academic ecosystem exceptional,” Kumar said. Wake Technical Community College will partner with Infosys on workforce development for the Raleigh hub. The 72,000-student college has multiple campuses, including a new Research Triangle Park location focused on advanced technical programs and customized workforce training for corporations in Wake County. The Triangle region also has three tier-one research universities – N.C. State, Duke and the University of North Carolina-Chapel Hill. N.C. State’s master’s in analytics program could supply some of the talent for the Raleigh Infosys hub, which will likely specialize in big data and focus on serving companies in the financial services, pharmaceutical and industrial manufacturing industries. During three visits to North Carolina, Infosys executives also met with local and state officials including Gov. Roy Cooper and Commerce Secretary Anthony M. Copeland. At one point, the governor helped refocus Infosys on North Carolina when a competing state moved forward in its bid for the hub. Both Kumar and Varma were struck by the public- and private-sector teamwork that helped North Carolina and Wake County land the second Infosys hub. About the author: Mary Wilson is public relations and communications manager at the Economic Development Partnership of North Carolina. Interested in locating or growing your business in North Carolina? Email our business recruitment team or call us at 919-447-7744.